Protective boots are a must when using a chainsaw. 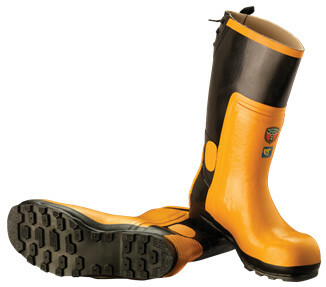 These protective chainsaw boots are not only lightweight and comfortable, but look stylish too. Offering protection against chainsaws with a chain speed of 24m/s (class 2), the Universal chainsaw boots offer suitable for most homeowner chainsaws. Made from a highly durable rubber making them easy to clean, they come with a non-slip sole and a steel toe cap to protect your toes against falling branches and logs.